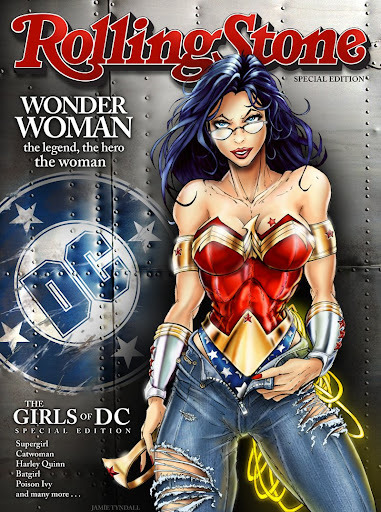 I want to clear any confusion about the Rolling Stone "Girls of DC" artwork posted in my DeviantArt gallery. I received some messages from fans asking when the issue would be available. I wish it were a 'real' project culminating with the publication of my work, but no, it's not the case. I am an art director by trade and I've worked in both web and publishing. The idea of a special edition issue of the Rolling Stone showcasing the girls of the DC universe was a fun way to blend my daytime job with my love of comics. Based on the feedback I received on the Wonder Woman and Supergirl pieces I posted online, I would say that Rolling Stone and DC should consider doing a similar project with maybe a different star artist for each one of the girls. And while we're on the topic of sorting things out, I should also clarify the situation with my Catwoman woman piece. I posted this piece as a work-in-progess in my DeviantArt and Facebook galleries and I have received emails asking if the pencils/inks are from Jim Lee or J. Scott Campbell. The confusion is clearly my fault as I didn't sign my work. I'm sure if you check out the inks for this piece, you will be 100% certain that it's not Lee or Campbell... I wish! But to all of you who asked this question, I want to thank you for the huge compliment! For the record, as of today, I have only coloured 5 inked pieces that are not my own work: 4 sequential panels of Fathom by Michael Turner and a Wonder Woman panel also by Turner.